Over twenty years ago, I used to play my trumpet and travel with a professional, Christian brass group called The King's Brass. The members of the group had a running joke whenever we would mess up on stage. When we had a break during our program and ended up backstage, we would look at each other and simply say: "No excuses, just results." This was a simple reminder for those of us in the group that we could make a bunch of useless excuses as to why we messed up if we really wanted to. Our "chops" were tired. We didn't get enough sleep the last few nights. It had been a long day of driving. You name it, we could come up with a variety of excuses as to why we messed up. But, in that moment, we also knew that we had a job to do. We needed to quit making excuses for our mess ups; and then, we needed to turn things around and produce extraordinary results. In Jeremiah 1:4-10, we see the Lord coming to Jeremiah and announcing his destiny - "I chose you…I set you apart…I appointed you a prophet to the nations." But what does Jeremiah do? He proceeds to make excuses. He tells God, "Oh no, Lord, God! Look, I don't know how to speak since I am only a youth." To paraphrase Jeremiah, "I'm bad at public speaking and I'm way too young. Lord, this can't truly be Your will for my life!" And what was God's response to Jeremiah's excuse making? In a nutshell, He told Jeremiah to stop making excuses. But why should he stop? Because God promised to take care of all of those things that Jeremiah feared. God was with Jeremiah. He would put the exact words that Jeremiah needed to speak into his mouth. Jeremiah just needed to get out of the way and allow God to do the work. 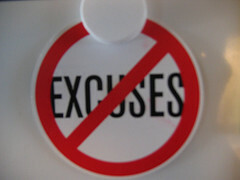 If God has called you to do something, then it's time to quit making excuses. If He wants you to teach a Bible Study class in your church, then He will empower you to do that. If He wants you to be a part of the worship ministry in your church, then He will give you the time and ability to lift His name in praise on Sundays. If He wants you to be part of a missions trip to Africa, then He will provide you with the necessary resources in order to be able to accomplish that trip. I don't know what God has called you to do that you are currently making excuses about. As Christians though, it's time for all of us to stop limiting God through excuse making. Embrace His choice and appointment for your life. No excuses, just results. Do you like to make excuses? What are some excuses that you're currently giving God even today?